Metalworking is the process of shaping a metal into a part or component. Among the most common metalworking techniques is metal drawing, a process that entails pulling a metal through a mold or die. Like the similar extrusion process, during which a metal is pushed through a die using a draw punch. Metal drawing can result in a metal with a depth that equals or exceeds its width or radius. 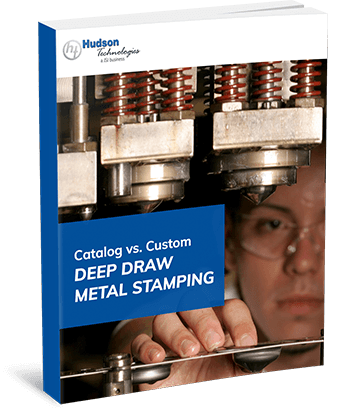 Sometimes referred to as deep drawing, this variation of metal drawing can produce high-strength, low-weight products while offering significant cost savings, making it an ideal solution for many manufacturers. Metal drawing is generally performed cold, which means that the metal to be shaped is kept at room temperature rather than heated. A cold metal drawing process ensures greater accuracy in the drawn product’s tolerances, better grain structure, good surface finishes, and overall improvement in its properties. During metal drawing the blank, is inserted through the die and mechanically gripped in order to pull it through. As it travels through the die, the workpiece will take the shape of a hollow box-shaped or cylindrical vessel. The sides may be straight, tapered, curved, or a combination of all three depending on the shape of the die. The workpiece can then be drawn through an additional series of dies in order to further reduce its diameter and increase its length with only minimal changes to the thickness of its walls. In comparison to other manufacturing processes, metal drawing much lower tool construction costs. Aside from its reduced operational costs, it also can yield lightweight products without compromising their strength or integrity. The process is also especially good for creating cylindrical parts and components. Metal drawing is particularly well-suited to high-volume production runs. Because it can be performed with automated machinery, it can continue for long periods with little downtime and minimal upkeep. Because parts or components are formed from a single blank, they do not have seams. Metal drawing is can be an automated metal process, capable of producing high volumes of products in short periods of time. Metal drawing can produce an array of complex shapes with impressive detail and accuracy. Because metal drawing offers superior precision, the potential for automation, and rapid production, users require less labor to handle it. Since 1940, Hudson Technologies has excelled in drawing parts and components made of high-performance metals such as titanium, stainless steel, aluminum, and cold rolled steel. We particularly specialize in deep drawn metal enclosures, or cases, and stampings, including metal diaphragms. Guided by our commitment to collaboration, we work with our clients from start to finish to ensure they develop a product that meets the demands of their intended application. Whether you require a prototype or a high-volume production run, we have the experience and expertise needed to manufacture a durable and efficient solution that’s tailored to your company’s needs. To explore the benefits of working with Hudson Technologies, request a quote for your next project on our website today.